Crompond Crossing is a new development built in 2014 conveniently located on Crompond Road in the Town of Yorktown. The homes are situated along Route 35/202 on the Bee-Line bus route. The location offers easy access to nearby shopping, day care, restaurants, medical offices, etc. 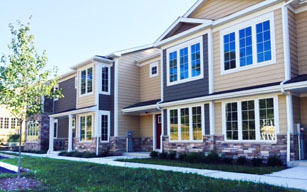 The 26 newly constructed, Fair and Affordable Housing Property town homes are approximately 1320 square feet in size and have three bedrooms and 2 and 1/2 baths. Each has its own entrance and attic storage. The first floor contains a great room, kitchen, with Energy Star appliances; dining room; the 1/2 bath; and some models also have a den. The second floor includes three bedrooms and two full baths. Each home contains a separate HVAC system, which, like all appliances and lighting, is Energy Star rated. Ample on-site parking is also provided. To view all new townhouse listings for sale in this community visit: Crompond Crossing.